How To Sync iPhone Text Messages In Three Different Ways? Want to sync all the text messages so that you can have multiple backups and you can transfer and restore them to new iPhone freely. Besides, you don’t need to panic when your messages get lost or deleted accidentally. Now let’s get down to the different three ways to accomplish the mission of transferring text messages. 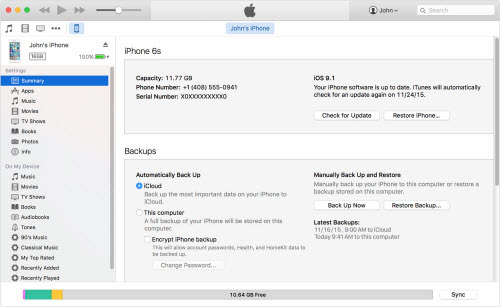 To sync text messages to iTunes, you need to perform a backup. > Open iTunes and connect your device to your computer. > You can either encrypt your backup: Select the box called Encrypt [device] backup and make a memorable password or simply make a backup that isn’t encrypted simply through clicking Back Up Now. > After the process ends, you can see if your backup finished successfully in iTunes Preferences >Devices. > You should see the name of your device with the date and time that iTunes created the backup. After the backup is created, all your text messages have been synced to iTunes, you can use a third party app like iExplorer to view your text messages. With the backup file, you can either sync all the messages to any ios device you have or to newly-purchased iPhone. By the same token, you need to create an iCloud backup to sync all the text messages to iCloud. Here is how. > In iOS 8 or later, tap Settings > iCloud > Backup. Make sure that iCloud Backup is turned on. > Tap Back Up Now. Stay connected to your Wi-Fi network until the process completes. 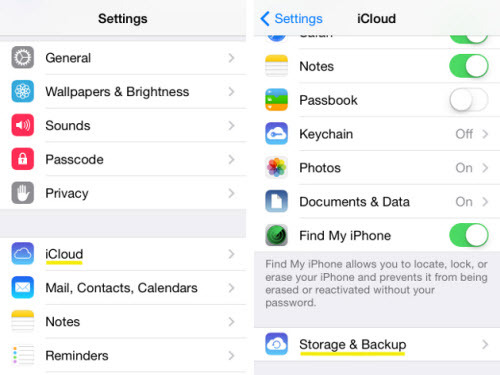 Now, you can download the text messages from iCloud backup file for saving or transferring. 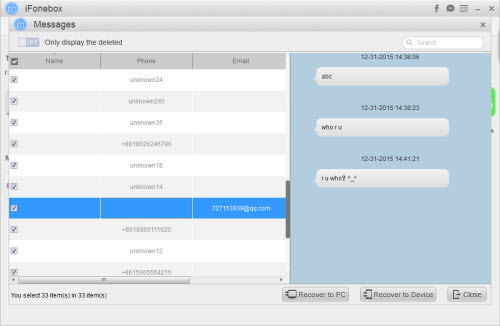 With professional iPhone data recovery software, you can sync all the text messages to computer selectively. Here in this post I would like to take iFonebox for demonstration. > Connect your iPhone to your computer and click Start after your iPhone is recognized by iFonebox. > Choose text messages to scan selectively by clicking on the icon of messages from the interface listing all the supported data categories. Note:The data scanning and analyzing will take quite a while if you have a large amount of text messages on your iPhone, please wait patiently. > Preview all the exported messages items after the scanning process is completed. Select all or whatever you need to recover to your computer by clicking on “Recover to PC”. How To Sync Contacts from iPhone to Outlook? This entry was posted in iCloud, iPhone, iTunes, Messages and tagged iCloud, iTunes, sync iphone text messages, sync text messages, sync text messages from ipone to computer by IosdroneD. Bookmark the permalink.